Barcode picking has been around for some years now to direct a warehouse picker and to integrate each picker with the materials handling system. The barcode scanners themselves have developed into an entire range to choose from. The process is fairly simple, the system communicates with the scanner to direct the picker, this usually includes what to pick, where to pick from and the quantity to pick. As orders become more and more complex it has become essential to integrate accurately with the system. Customer requirements to submit complex orders, collating different kinds of products to minimise transportation and inventory costs means efficiently and accurately directing pickers through the system. This is best done through arm mounted scanners. These scanners communicate directly with the system to effectively direct the picker and minimise error. The fact that the scanners are arm mounted allows the picker to pick with both hands, and check each order directly against the system for accuracy. The system automatically directs the most cost effective route minimising time wastage for example when a picker visits an area to pick twice when they could have picked in one visit. Arm mounted barcode scanners also allow for real time stock and picking control, giving greater efficiency and control. The system also gives an opportunity for reports on individual picker efficiencies. 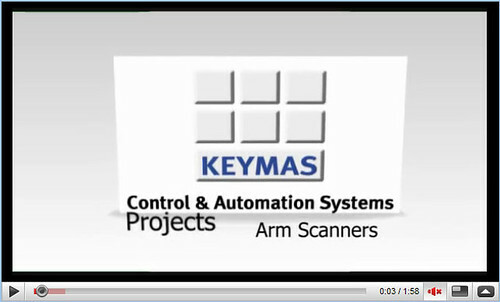 For more information visit www.keymas.co.uk. Leading suppliers of integrated materials handling solutions. Providing conveyor systems, warehouse management systems, mezzanine floors within an integrated materials handling environment. Also visit www.k-store.co.uk for a low cost warehouse management system.